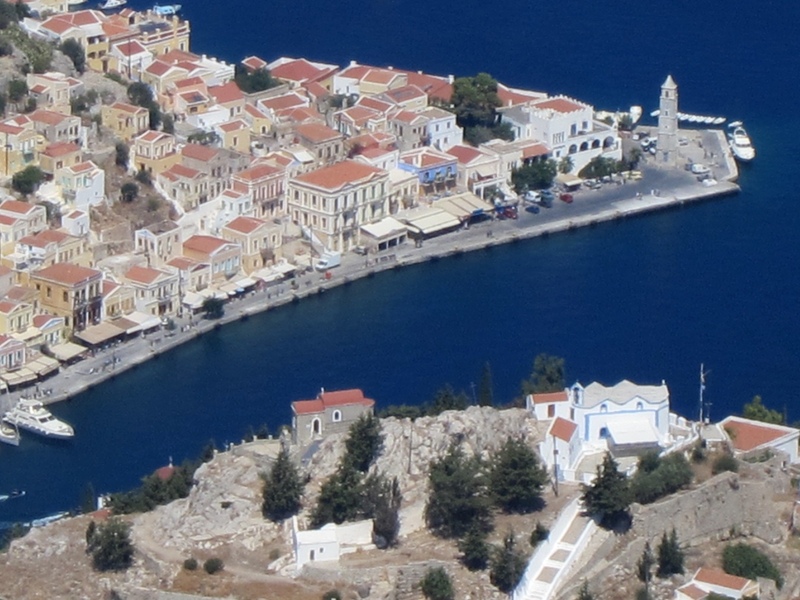 Until the 1990’s when a long zig-zag road was built connecting the harbour with the old town, Horio, on the hill to the South the principal route was a long flight of several hundred wide steps known as the Kali Strata. 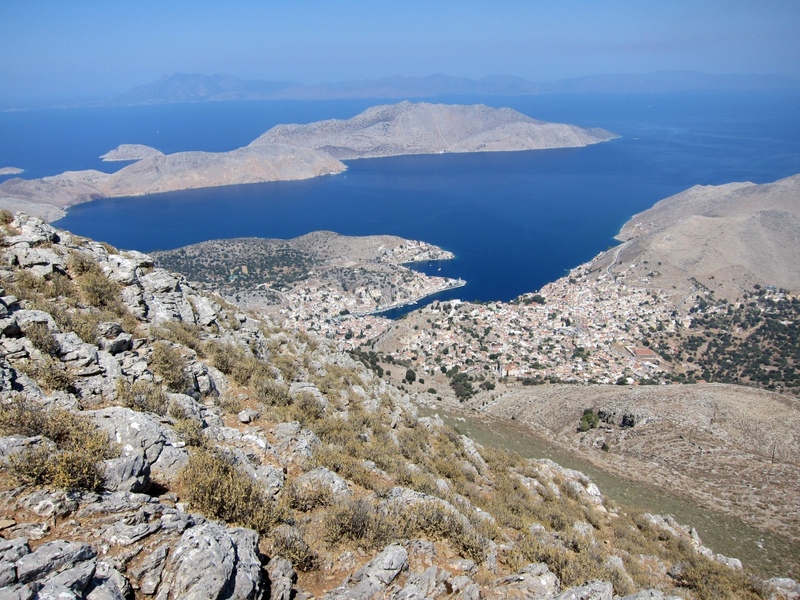 As you reach the tavernas towards the top there is a view straight up to the top of the highest mountain on Symi, the 617 metre high ’Vigla’. It is very steep, dramatic and intimidating as a challenge. 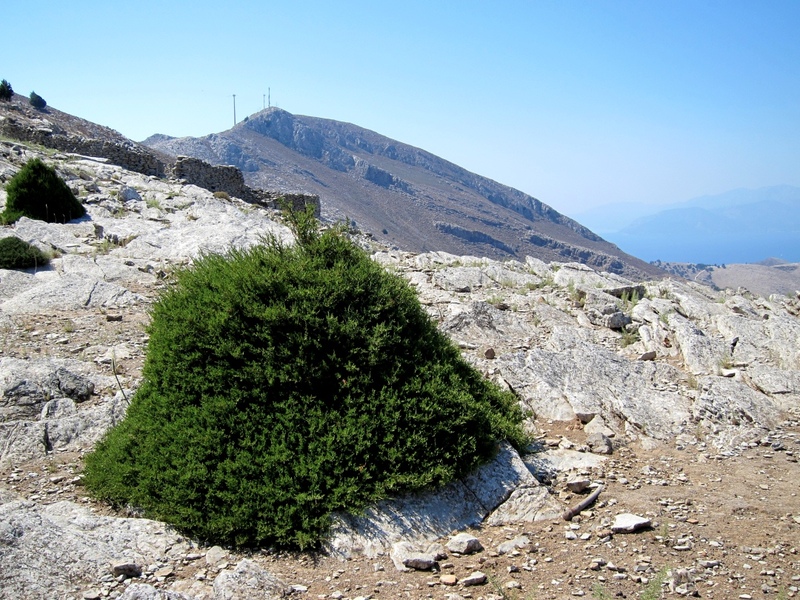 I have climbed Vigla a few times, aiming to do it once each time I’m here. 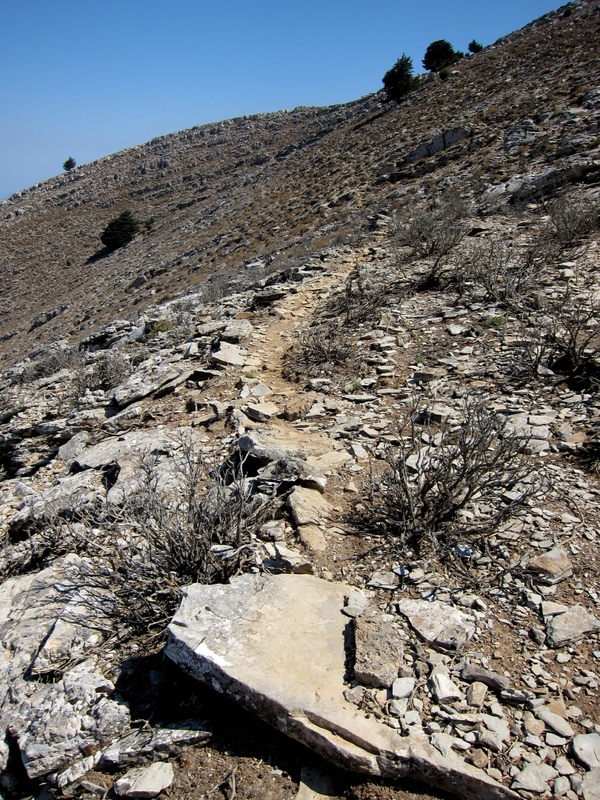 The route I have taken is via a mid-level path going to the deserted village of Gria at the end of the ridge, climbing the mountain behind and then following the top of the ridge to Vigla. The descent is straight down one of the rocky spurs that is seen from the top of the Kali Strata. Enfys did it once but declined to do so again so I took to doing it early morning and meeting up about 11.00. 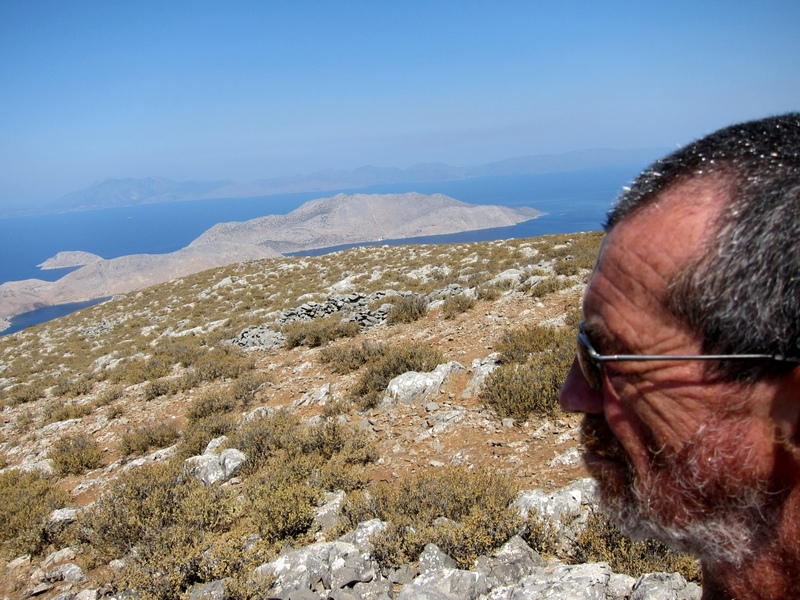 It’s not the longest walk on the island but is very tiring with nil shade and, once at Gria, no path at all. 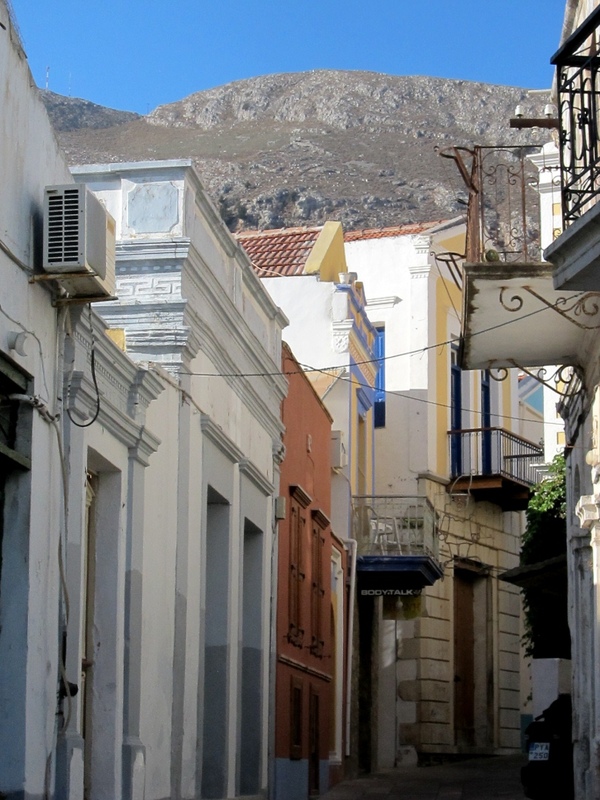 I eye Vigla and the challenge it represents every time I’m at the top of the Kali Strata, which, as the hotel is just round the corner, is frequently. I mused about reversing the route and going straight up the rocky spine to the top. Sunday I decided to go for it. It is steep, sustained and very rocky. 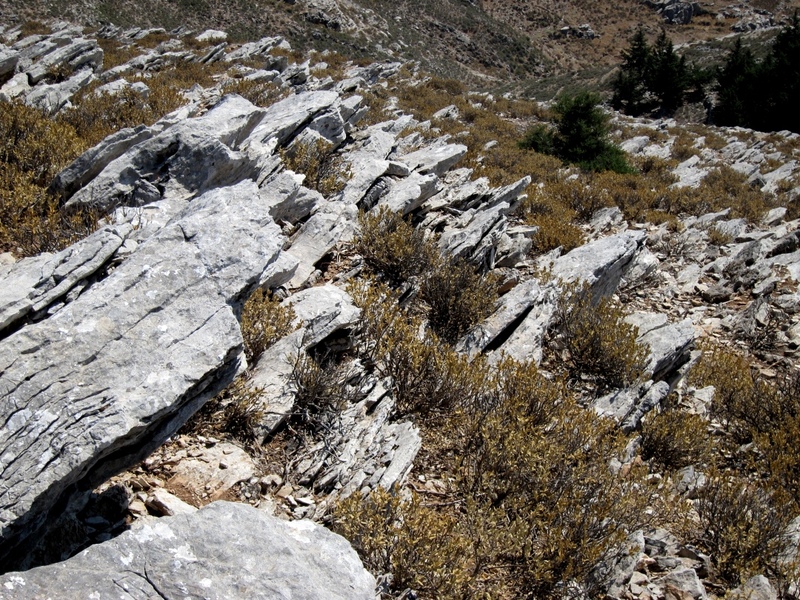 Great care has to be taken because in places the surface is lose scree, in other places razor-sharp rocks. But for once, much of the vegetation, what little there is, is not too aggressive. Nevertheless, pretty soon my shins were not fit to be shown on daytime internet. I stuck to my principle of keeping a steady pace without stopping at all on the way but it was touch and go. Perhaps age is catching up on me. It took me less than 1½ hours to reach the top but I was drained. Coming down I simply reversed the route I normally take on the way up. I had been hopeful of finding a path along the ridge, sometimes easier on the way down from the top than on the way up, but there isn’t one. There were bits of very well used goat track but they can’t be relied on. Much of the way was picking a route over and around rocks. Pick a way over this lot then! I eventually dropped down to the little slab of rock I swim from at Pedi and was never more glad to get there. Needless to say the swim was very pleasant. I have rarely been so tired in the evening and went to bed earlier than I can ever remember. I turned the light out at 23.15 !!!!!!! Meeting a challenge is not without its costs. 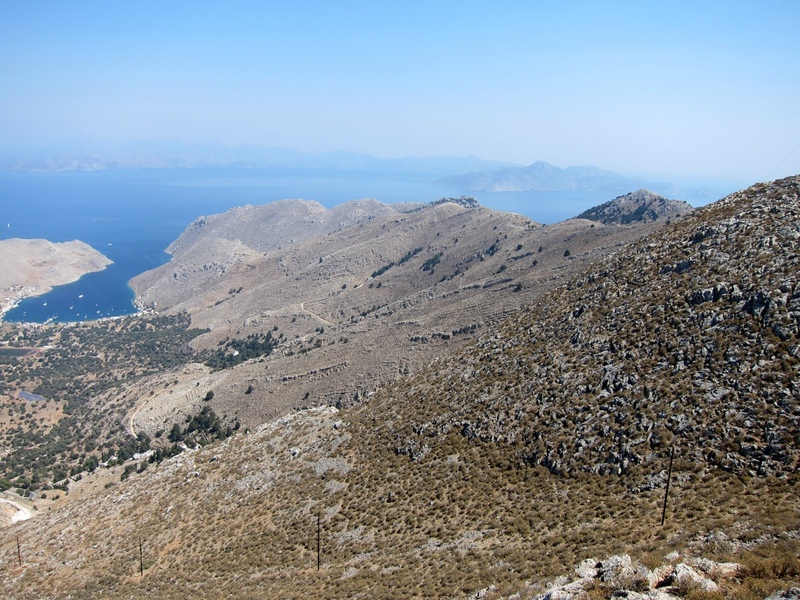 There is a road up the other side of Vigla to service the telecom masts on the adjoining peak. But where is the challenge in that?